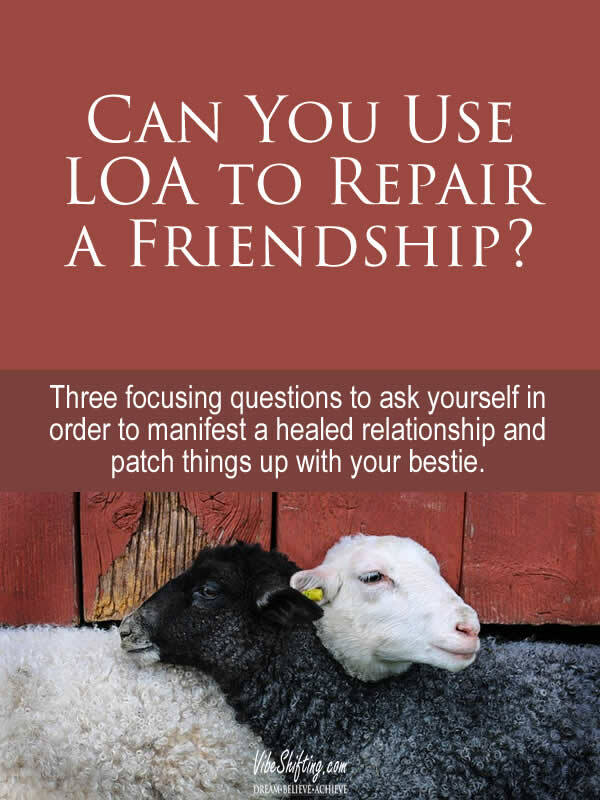 Can You Use LOA to Repair a Friendship? I’m fairly new to the LOA, but am wanting to manifest a restored friendship with a specific person. I’m feeling really positive that it will happen… had 3 dreams recently that included this person and they were positive; there’s just a little doubt and fear every now and again that creeps in. How do I become a vibrational match to manifesting this specific friendship? This is a great question, and one that I think we all deal with in one form or another, at various points in our lives. What does this friendship mean to you? Why is it that this specific friendship is so important to you? What was it about this friendship that was so wonderful? How did your friendship with this individual make you feel? Really get to the heart of what this particular friendship means to you. What does this person mean to you? How does he make other people feel whenever he is around? What are his greatest strengths or talents? What kind of resolution do you want to see? Take a few minutes to visualize a positive resolution to the situation – see yourself and this person interacting as friends once again; picture a situation that would be perfect for the both of you. Where are you and what are you doing? See all the details and feel what it’s like to be with your friend again. Once you’re in a great-feeling, high-vibration place about your situation, reach out to your friend. You could suggest coffee or lunch or drinks or whatever feels right. If your friend is also ready to renew your friendship, then you will now start to build that new relationship together. Have you ever been in a situation where you wanted to heal a rift in a friendship? What did you do? What would you suggest our awesome reader try in order to patch things up with her friend?